What is Dobby Shedding in Weaving? In textile weaving industry, dobby is a shedding device which is placed on the top of a weaving loom in order to produce figure patterns by using a huge number of healds than the capacity of a tappet shedding. 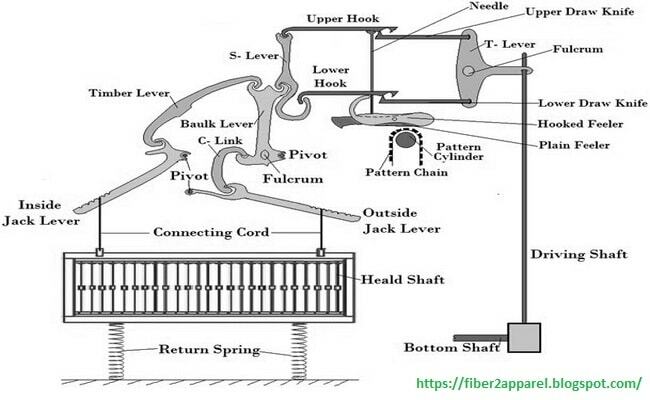 Dobby is a mechanism which is attached with a weaving loom to control the movements of heald shafts. In weaving sector, the scope of dobby shedding is limited between the uses of jacqua wards and tappets. When the number of shafts to be controlled or the picks to a repeat of the design is beyond the range of a tappet shedding, but is at the same time too small to be economically produced by a jacquard, this dobby shedding mechanism is sued. The total number of heald shafts which can be actuated by dobby varies between 6 and 40. Double acting or double lift. When the connecting rod moves up and down and T-lever gives outward and inward movement. According to fabric design, when peg comes in contact with the feeder, then the right portion of feeler is raised and the left portion being lowered. Hooks are lowered as hooks are supported with feeler. When the left end of feeler is lowered then the upper hook came in contact with the upper knife. In this state, when connecting rod moves down, the upper portion of T-leavers gives outward movement. As a result, upper portion of S-lever, baulk lever also moves to the right side. Thus a pull create on timber lever and link. As outside and inside jack lever joined with the timber lever and link, the lever moves up at the same time. Hence, the heald shaft rose up. Similarly, when the left end of the feeler is lowered then the lower hook comes in contact with the lower knife. In this case, when connecting rod moves up and the bottom portion of T-lever moves to the right side. As a result, bottom portion of S-lever moves to the right and the same process occurs i.e. top portion of the baulk lever moves to the right. Here, jack levers are moved at the same time. Hence, the heald shaft again rose. Thus a heald shaft is alternatively rose by the lower knife and upper knife. The shaft will therefore be lowered with the help of return spring and will remain down for the next pick. In cotton industry, maximum 24 shafts dobbies are used. But mostly 16 to 20 shafts are used. In worsted industry, dobbies with 36 jacks are in uses and many of them are positive in action and suitable for heavy shedding. The chance of pattern in the fabric, in dobby loom, can be readily done where as it is laborious and expensive in case of tappet. Dobbies offer better facilities for producing a variety of patterns with more number of healds than that is possible with tappets. Dobbies are extensively used for weaving twill, sateen and other simple weaves.